Hot glass combing is carried out by drawing a metal tool across molten glass, the procedure is carried out at a high temperature of about 1700 F (927 C). 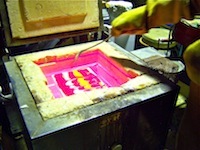 The glass is heated to this temperature, the fused glass kiln is then opened and the combing tool is drawn across the glass to form original and colorful patterns. A combing tool or rake for fused glass combing is usually a metal rod bent on one end with a blunt tip. For safety reasons it should be equipped with a wooden handle. Full metal rods should be avoided as electricity may be present if the rod accidentally comes into contact with a hot kiln element, even if the kiln has been switched off. Rods of different lengths can be purchased or made. Some people used stainless steel barbecue tools for combing. Stainless steel or brass can be used, do not use copper or aluminum. Rods should be about two to three feet long depending on the size of your warm glass kiln. A metal hook can be screwed into a broom handle to make a combing rake. Rods like this will need to be soaked for twenty four hours prior to each combing session to ensure that the wood does not catch fire. Because fused glass combing is carried out at high temperature it is essential that proper safety precautions be observed. Do not wear synthetic clothing, wool or cotton are best, long sleeve shirt or protective jacket should be worn. Heatproof gloves are essential, Kevlar or Zetex gloves are recommended. Remove dangling jewelry and tie back long hair. To block infrared radiation glass kiln safety glasses must be worn. If you have not worked at high temperatures before it is advisable to work with an assistant for safety reasons. Do not use thin fire paper for fused glass combing, a kiln washed shelf with additional layers of kiln wash applied can be used. Fiber paper is also suitable. Glass strips of various colors about 3/8" wide should be cut and placed on their edge on the prepared shelf. The glass should be placed as per normal fusing with about a two inch clearance to the kiln shelf edge to allow for the glass spreading during the combing process. You can also place a sheet of clear glass on the shelf and scatter small scrap pieces of glass across the base glass. Whatever method you use the glass should start at 1/4" to 3/8", thinner than this may result in holes in the glass. Once the glass has been placed in the glass fusing kiln you can begin to heat the glass rather quickly up to about 1700 F (927 C), soak the glass at this temperature for a few minutes. The glass should be glowing a very bright red at this temperature. Make sure you are wearing your safety gear. Switch off the glass kiln and open the door, be careful of a gust of hot air from the kiln when the door is opened. Switch off kiln, being careful not to touch the sides of the kiln reach in with your combing tool and draw the tip firmly across the glass, do not push the tool down through the glass and create holes. You can either push the tool or pull it towards you. It is possible after some practice to use two rods one pulling, one pushing. It's easier to start with one. 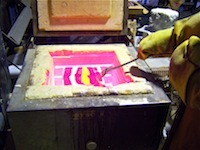 Pull in a straight line and begin to create your pattern, after a couple of passes the glass will begin to cool. Close the kiln door and re-heat, repeat the combing process until satisfied. 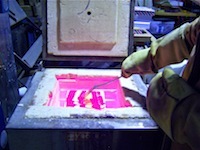 Glass may stick to the rod tip, hold the tool above the glass and remove from the kiln. Dip rod into cold water, dry the rod before commencing combing again. Start of fusing glass raking. Glass raking continuing. Final stages. When you are satisfied with your pattern let the glass sit at about 1500 F (816C) to smooth out the marks left from the rod. You should now let the glass cool down through your normal annealing cycle. You may have some kiln wash left on the glass, which you will need to remove. The finished glass can be cut and made into fused glass jewelry pieces. It can be sliced and used in other fusing projects such as dishes, platters ornaments, etc. It can also be cold worked and used as an ornamental piece. An example of this process can be seen in this demonstration by Patty Gray at Uroboros glass.